Lyman Dally's answers would have been posted a couple of weeks ago, but unfortunately they disappeared into cyberspace and never made their way to me. A special thanks goes out to Lyman who was nice enough to redo them AND he even supplied me with a bio to use. Thanks Lyman! Lyman Dally, former skinny kid turned competitive bodybuilder who used his experiences to become a leading fitness/bodybuilding illustrator from the early '80's thru' 2007. Created sci-fi adventure series MAX REP in the Age of the Astrotitans which ran in Flex magazine and then Muscular Development magazine for a total of 10 years. Did over 5000 editorial illustrations for Muscular Development. Taught anatomy/life drawing at The Joe Kubert School of Cartoon from 1991-1996, plus lectured comic book anatomy at The Big Apple Cons in Manhattan from 1997-1998. 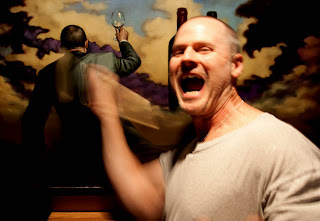 Presently doing surrealistic paintings on the love of wine and an online cartoon about the economy. Websites where you can learn more Lyman Dally and see some of his work: Lymandally.com, Oentourage.com and Livingwithles.com . I do 99% of my work with a Raphael Kolinsky #2 brush (orange handle). I even do most of the straight linework with this brush (the trick includes holding a ruler on its side). I draw in pencil first using a #3H pencil. Right now all by hand, but I'm slowly learning how to use PhotoShop. Windsor & Newton gouache and watercolors. If I'm airbrushing (yes, old fashioned airbrushing) I use Badger Air Opaque paints (do they still make these?). For big jobs I like 4-ply Strathmore (the big sheets). For smaller, simpler stuff I love Strathmore Bristol 300. I go to a local Jerry's Artarama. Coffee in the morning along with reading The New Yorker. I seem to draw better in the early afternoons thru' evening. I like spacey techno, 80's New Wave or dark moody stuff. Sometimes Gregorian Chants are fun. Superman, The Flash and The Incredible Hulk. I preferred strength-based superheroes. I liked "Blondie" when I was young, Peanuts in grade school and The Far Side and Red Meat as an adult. No. It was a library book on great escapes. I wish I owned it. I'm a good deal self-taught but I had wonderful experiences at The Joe Kubert School and a fabulous painting class (in '08) at The School of Visual Arts. BOTH! It's wonderful for research and promoting your work but HORRIBLE for real illustration jobs. If you look online everything is photos and text! No art. Mom was artistic and dad wanted to be. Both of my parents and their friends. Not really, but that is one of my New Year's resolutions. Yes. I taught for 5 years at The Joe Kubert School. I got burnt-out on it near the end. Passion uber allis, but talent is also important. I've met many enthusiastic artists with no talent. Conan the Barbarian-but I'm not sure he's ever been animated. Perhaps the most fun on a gender-bending slant would be Eon Flux! Attic studio with money-green slanted walls, track lighting and a lovely window at each end that I can look out of. No. Absolutely no talent (see question on talent above). PERFECT YOUR CRAFT! Don't show the world your work before you've spent a lot of time and made it as good as possible. Also learn business and legal concerns so you won't get cheated and undermine the art business in the process. Boris Vallejo, Peter Paul Ruebens, Frank Frazetta, Richard Corben and Bernie Wrightson. I know that's not "one". Below is a painting by Lyman entitled, "Heart of Glass." More of Lyman's work like this is available here . The next set of answers are from cartoonist John Klossner and with any luck should be posted tomorrow.